Invited to take part in The Independent, the Boa Mistura collective has chosen to present Agopuntura nello spazio pubblico, a selection of materials from the project for social change Crossroads aimed at vulnerable communities with a high risk of marginalization. The stairwell in the MAXXI atrium will house a digital wall composed of 14 monitors that will come to life periodically with images, videos and interviews documenting the interventions in South Africa, Mexico, Panama, Algeria, Georgia, Cuba, Brazil, Kenya, Colombia, Nicaragua and Chile. In all these places Boa Mistura has established contacts with the local communities through participatory dynamics: the inhabitants of the various quarters have been involved in actions of aesthetic improvement that modify perception of the places, reinforcing people’s relations with and in the space in which they live. They met when they were 15 years old and creating graffiti on the walls of their quarter of Madrid. 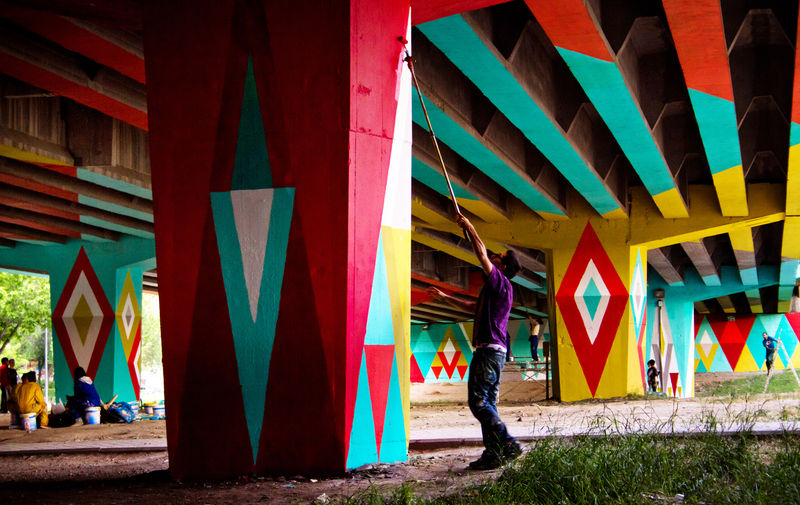 Today they work throughout the world, involving entire communities in the transformation of the streets in which they live through painting.